Selling my loved items to fit more in my wardrobe 😬 🌹 can combine for postage. Message me offers! Amazing condition sold out everywhere! Stunning dress. Perfect condition! Sold out. Size XS. Brand new with tags! Size 8. 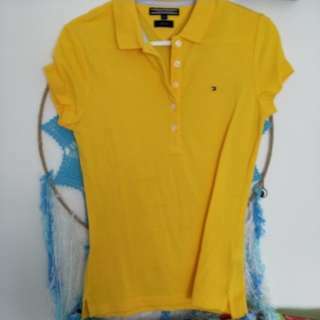 Yellow polo genuine Tommy Hilfiger. Size XS. Perfect condition. Sabo Skirt bright orange dress. Size Small however I altered it professionally to fit a size xs so it would fit a size 6. Perfect condition. Spell Designs hotel paradiso bikini. Size XS tie side bottom and Size Small bandeau top. Stunning print with beautiful blue tassel detail. Worn once only. Perfect condition. Kookai Francesca Dress Red Size 34. Never worn. It's a stunning dress with amazing detail. It's a bit hard to zip up around the middle because it's a thick material but not an issue. Perfect condition. Can send photos through message. Meshki Sage Bustier and Skirt. The top is size small and skirt size xs. Top has detachable straps. Outstanding two piece set only worn once. I Am Gia Furiosa Red Bikini Top with gloves. Size Small with adjustable back string. Perfect condition. Bamba Swim Khaki Green Top and Bottom. Size Small which is their smallest. Small made at the bottom. Worn once for a shoot. Great condition. In The Style Sarah Ashcroft collection black asymmetrical cut out jumpsuit. Worn once for my birthday. Excellent condition. 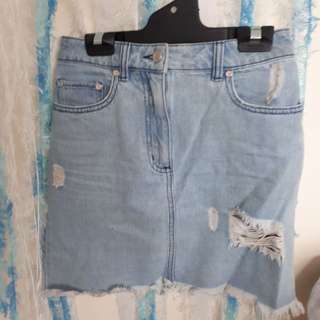 Kookai Denim Skirt size 36 aka size 8. Good condition. Genuine Andi Bagus Gold Lumina Bikini size xs/s. Worn once only for a shoot.